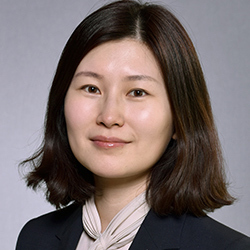 Hyejin Youn is an Assistant Professor of Management & Organization Department at the Kellogg School of Management, and a core faculty at NICO, the Northwestern Institute on Complex Systems. She is also Royal Society of Arts fellow, and an external fellow at London Mathematical Laboratory, London, UK. Prior to joining Kellogg, she worked at University of Oxford, Harvard University, and MIT Media Lab, and Santa Fe Institute, as a research fellow. Hyejin received her PhD in Physics in 2011 from Korea Advanced Institute of Science and Technology (KAIST). She was a Principal Investigator of the project a National Science Foundation grant (USA) to study Technological Change from the Map of Capabilities. Her research interests are to understand the interplay between technological innovation and socio-economic systems (urbanisation, economic diversity and specialisation, invention activity, future of work). Her highly interdisciplinary approach often results in broad collaborations ranging from mathematicians, computer scientists, economists, sociologists, anthropologists, to archeologists. Her work has been published in general audience such as Nature communication, and PNAS, as well as top specialized journals such Physics Review Letter, and Evolutionary Anthropology, and has been featured in The Econonmist, Forbes, The Guardian, Scientific America, MIT Technonlogy Review, among other major global media outlets. Her goal is to develop a theoretical, yet empirically grounded, framework that will enable us to turn the increasing volumes of data into scientific insights and well-designed policies, an approach known as computational social science. The mathematical tools and computational methods that are used include scaling theory, spatial analysis (including percolation theory, information theory and fractal dimension analysis), statistics, and network theory. My research aims to develop a mathematical and computational framework to understand socio-economic systems.